A youth sponsorship initiative giving young people a first-hand opportunity to participate in the Territory’s great outdoor lifestyle was launched recently. The Minister for Youth Sport and Recreation, Matthew Bonson, officially launched a Hobie-16 catamaran at the Darwin Sailing Club as part of an NT youth development program created by Rotary Club Darwin North. CDU’s Faculty of Education, Health and Science sponsored the sail of the catamaran, as part of CDU’s community engagement program and linked to community sport, health and youth. Director, Youth International Rotary Club Darwin North and CDU lecturer, Dan Baschiera said that the training program was much more than just teaching young people sailing skills. “This is a proactive challenge to direct youth away from street racing, playstations and anti-social behaviour,” he said. 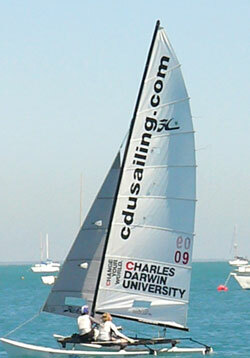 The Darwin Sailing Challenge program will give Darwin’s young sailors a chance to challenge the Australian Youth Multihull Nationals in the prestigious sailing competition taking place in Perth in January 2009. Winners of their class at the Perth regatta qualify for Yachting Australia’s youth team and will compete against 60 international teams in the Volvo Youth Sailing ISAF World Championship in Brazil in July 2009.